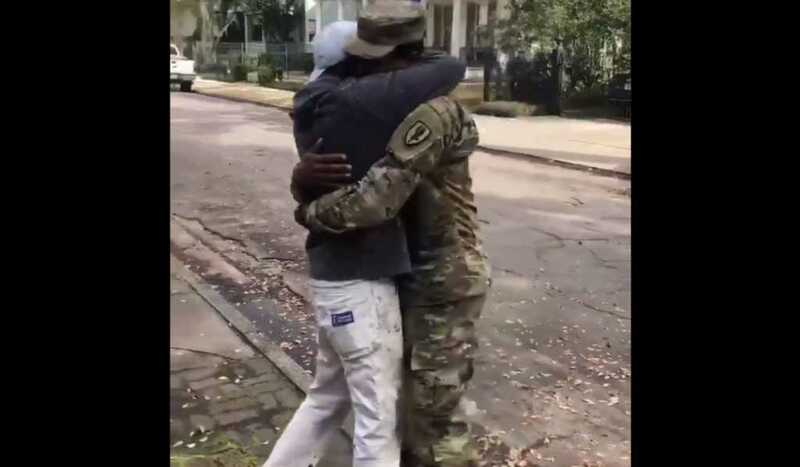 An incredible video has surfaced on social media showing a young soldier being reunited with his father. Surprising his dad while at work, military man Joshua Jeffries was filmed sneaking up on his Pops as he exited his work van. Initially, his father does not spot him, but when he does, the ensuing reaction is straight from the heart. “Who the h*** is that?” the dad says as a man in military uniform approaches him. “JOSH!” he exclaims after realizing it is his beloved son. “Oh man, why’d you do that to me? !” the proud dad says as he embraces his boy. “My baby is home!” he says as the two continue their embrace.